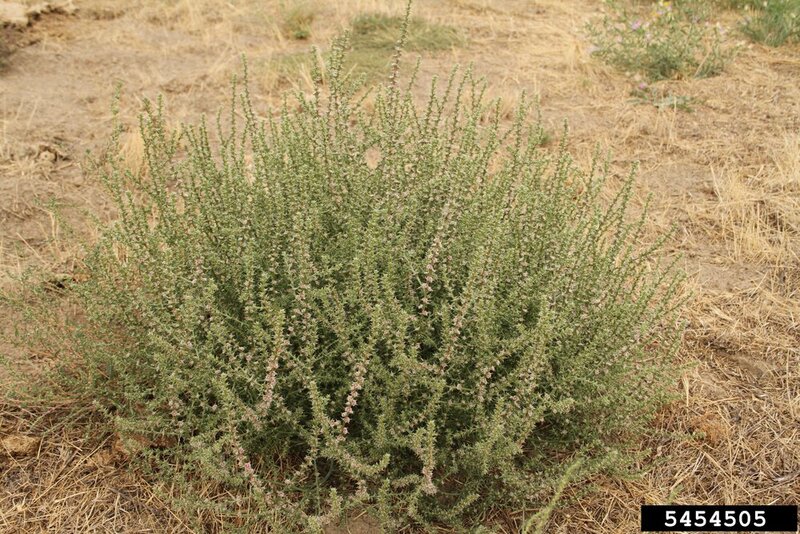 Reasons for concern: Dry Russian thistle plants are a serious fire hazard. This plant spreads easily because it breaks off at ground level and tumbles across the landscape. Seeds are scattered for miles. It quickly takes over a habitat of native plants, reducing plant diversity very important to wildlife and pollinators. Botanical description: Large, bushy plant with an over-all round shape. Although the plant feels prickly like a thistle, it is really not a thistle. Leaves: Leaves of seedlings soft, fleshy, green, and needle-like. As the plant matures, leaves become short, scale-like, and tipped with stiff spine. Stem(s): Slender, fleshy, and flexible, typically curving upward. Green, sometimes with red or purple stripes. Densely branched from base upward, growing ½ to 4 feet tall. Mature grayish-brown stems break off from the roots at the soil line. Flowers: Inconspicuous flowers grow in junction where leaves meet stem above spine-tipped modified leaves. Flowers lack true petals, but petal-like sepals are small, translucent, greenish-white, with pink to deep red veins, sometimes white. Mature early to late summer. Seeds: Germinate with little water. Viability is short. Roots: Usually fairly short, making young plants very easy to pull. Where it grows: Roadsides, over-grazed areas, semi-desert areas, deserts, in loose or disturbed soils at elevations up to 8,000 feet. Likes sun. Weedy characteristics: Seeds scatter as mature plants break off at ground level and tumble far and wide in the wind. A single plant can produce 200,000 seeds and can be easily spread by vehicles and equipment. Seeds germinate rapidly with or without much rainfall. Control strategies: Hand pull, starting when seedlings are about 1½ to 2 inches tall. Prior to then, seedlings compete for resources and many die off naturally. Seeds germinate well in loose soil, so be careful not to disturb soil. Monitor population frequently and pull any new plants. Do not let them bloom and go to seed. Population can be eliminated within 2 to 3 years of diligent work. Thereafter, monitor regularly. The best solution is to establish desirable species to out compete this invasive. 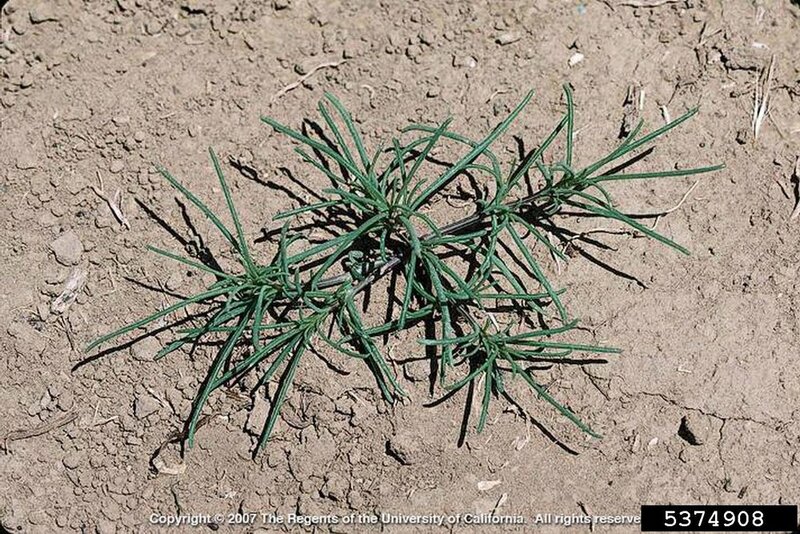 For large populations, broadleaf-selective herbicides are effective on very young plants. Pre-emergence herbicides can also be used. Images: Click on an image to enlarge and see the image citation.